New Tinytag Splash 2 logger, for high temperature environments such as washer disinfectors and dishwashers. Gemini Data Loggers has launched the Tinytag Splash 2 logger, specifically designed for high temperature environments such as washer disinfectors and dishwashers. The Splash 2 has the best features of its predecessor including an external probe for a fast response time; however the new logger has a higher resolution (16 bit), giving smoother graph read-outs from the Tinytag Explorer software. The ability to measure up to 105°C and to a depth of 15m makes the logger perfect for dishwashers, sterilisers and pasteurisation applications. With 32,000 readings and a factory replaceable battery, the product can now be deployed for longer, allowing faster measurement intervals. The Splash 2 represents a significant improvement over its predecessor. 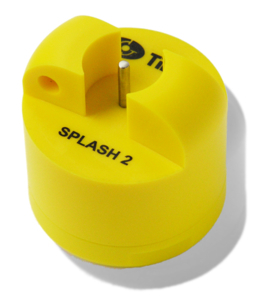 Housed in a highly visible yellow case, Splash 2 can also transfer information to the Tinytag Explorer Software via an USB inductive pad, eliminating the need for sockets with waterproof caps which can easily be lost. A trigger-start capability, visible alarm and low battery warning all make the logger easy to use. The new logger is compact, lightweight, robust and competitively priced. A more robust firmware monitors battery condition and provides improved data integrity. All of these benefits now enable more accurate monitoring, so why not take advantage of the new and improved Tinytag Splash 2 from Gemini Data Loggers.